EULA stands for End User Licensing Agreement. This is the agreement through which the software is licensed to the software user. 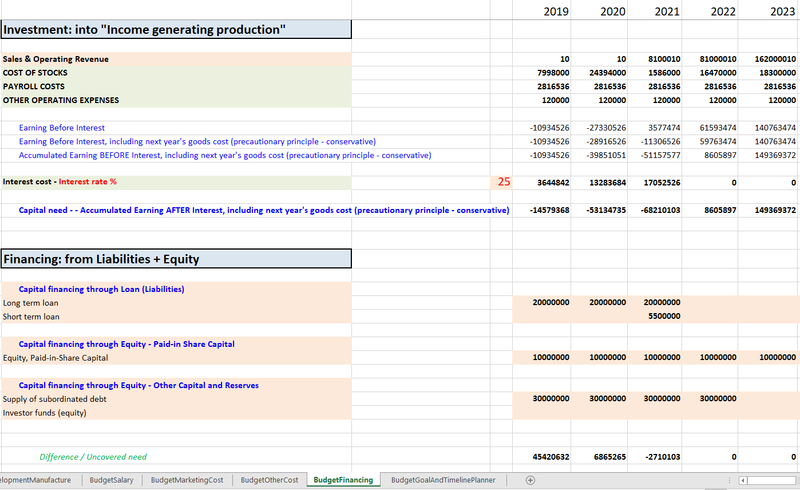 END-USER LICENSE AGREEMENT FOR USE OF ANY SOFTWARE DELIVERED FROM OR THROUGH OBSIDERI FISCUS AS / Excel-Accounting-Budget-Analysis.com (hereafter described as AUR). IMPORTANT, PLEASE READ THE TERMS AND CONDITIONS OF THIS LICENSE AGREEMENT CAREFULLY BEFORE ACCEPTANCE OF ORDER OR INSTALLATION OF PROGRAM FROM AUR. End-User License Agreement ("EULA") is a legal agreement between you (either an individual or a single entity) and AUR for the AUR software product(s) which may include associated software components, media, printed materials, and "online" or electronic documentation of the AUR software product. By installing, copying, or otherwise using the software product, you agree to be bound by the terms of this EULA. This license agreement represents the entire agreement concerning the program between you and AUR, (referred to as "licenser"), and it supersedes any prior proposal, representation, or understanding between the parties. If you do not agree to the terms of this EULA, do not accept order, install or use the software product. 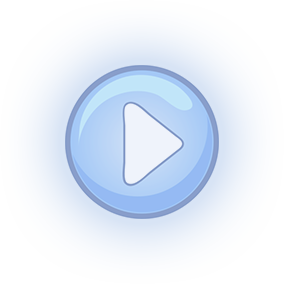 AUR grants you the right to install and use copies of the software product on your computer running a validly licensed copy of the operating system for which the software product was designed [e.g., Windows XP, Windows Vista, Windows 7, 8 and 10]. You may not distribute registered copies of the software product to third party. If evaluation versions exist for download from AUR's websites, you may freely distribute that. You may not rent, lease, or lend the software product to third party. AUR may provide you with support services related to the software product ("Support Services"). Any supplemental software code provided to you as part of the Support Services shall be considered part of the software product and subject to the terms and conditions of this EULA. Without prejudice to any other rights, AUR may terminate this EULA if you fail to comply with the terms and conditions of this EULA. In such event, you must destroy all copies of the software product in your possession. All title, including but not limited to copyrights, in and to the software product and any copies thereof are owned by AUR or its suppliers. All title and intellectual property rights in and to the content which may be accessed through use of the software product is the property of the respective content owner and may be protected by applicable copyright or other intellectual property laws and treaties. This EULA grants you no rights to use such content. All rights not expressly granted are reserved by AUR. AUR expressly disclaims any warranty for the software product. The software product is provided 'As Is' without any express or implied warranty of any kind, including but not limited to any warranties of merchantability, noninfringement, or fitness of a particular purpose. AUR does not warrant or assume responsibility for the accuracy or completeness of any information, text, graphics, links or other items contained within the software product. AUR makes no warranties respecting any harm that may be caused by the transmission of a computer virus, worm, time bomb, logic bomb, or other such computer program. AUR further expressly disclaims any warranty or representation to Authorized Users or to any third party. In no event shall AUR be liable for any damages (including, without limitation, lost profits, business interruption, or lost information) rising out of 'Authorized Users' use of or inability to use the software product , even if AUR has been advised of the possibility of such damages. In no event will AUR be liable for loss of data or for indirect, special, incidental, consequential (including lost profit), or other damages based in contract, tort or otherwise. AUR shall have no liability with respect to the content of the software product or any part thereof, including but not limited to errors or omissions contained therein, libel, infringements of rights of publicity, privacy, trademark rights, business interruption, personal injury, loss of privacy, moral rights or the disclosure of confidential information. 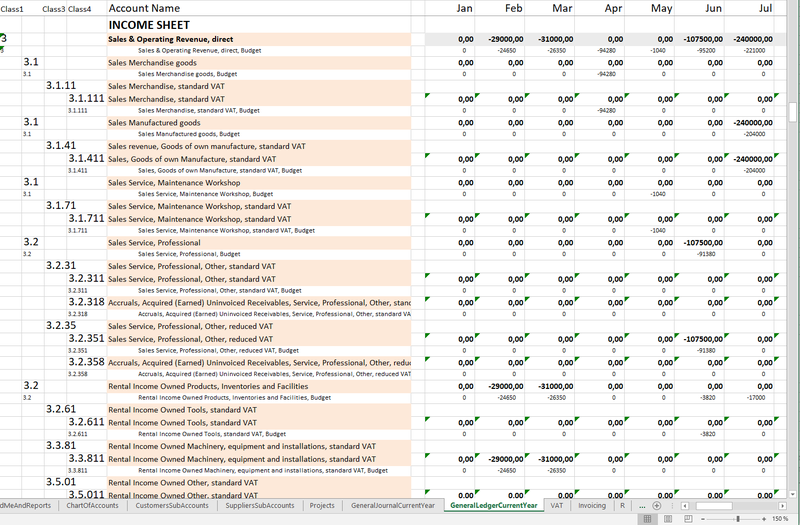 New software for small business / entrepreneur who likes the flexibility of MS Excel Workbook. Invoicing - "Let the 'MS Excel' force be with you!" 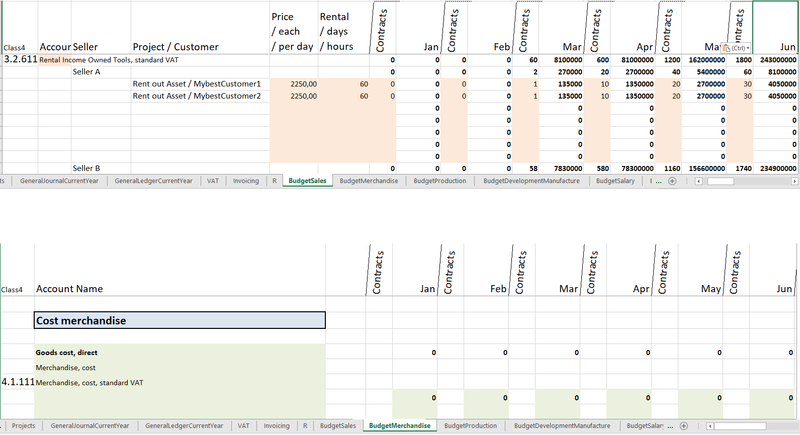 Easily input your customers, then do punching of your invoicing data, and produce your invoices (pdf and xlsx) with a click. Ideal for small companies, micro-entities, sole-traders and partnerships. 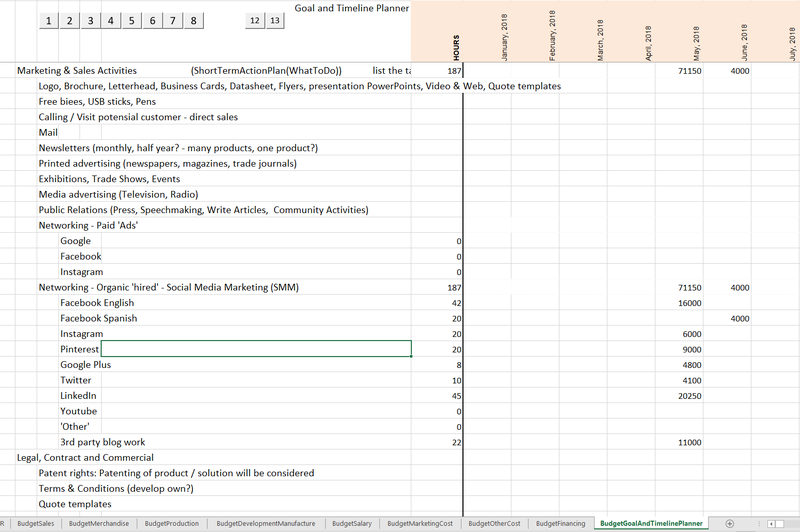 For your specific industry, prepare final need for accounts, picked out of Chart-Of-Accounts. 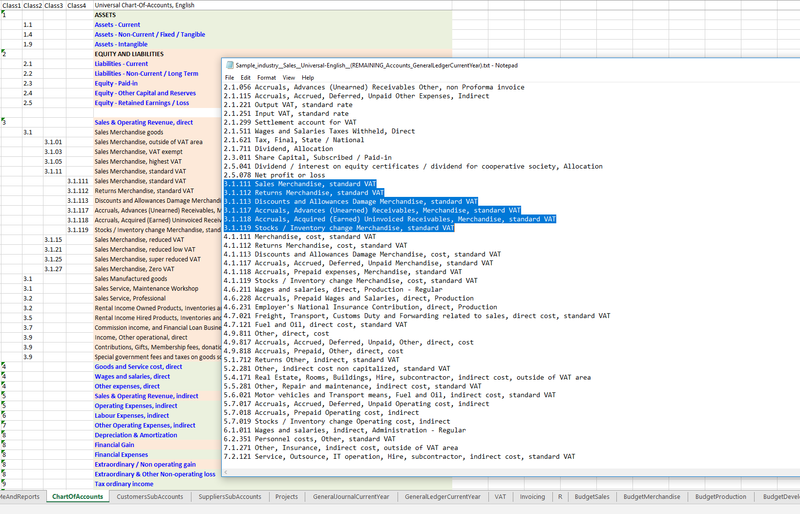 Easily punching of general journal data helped by input enhancement for date, customer, supplier and project. 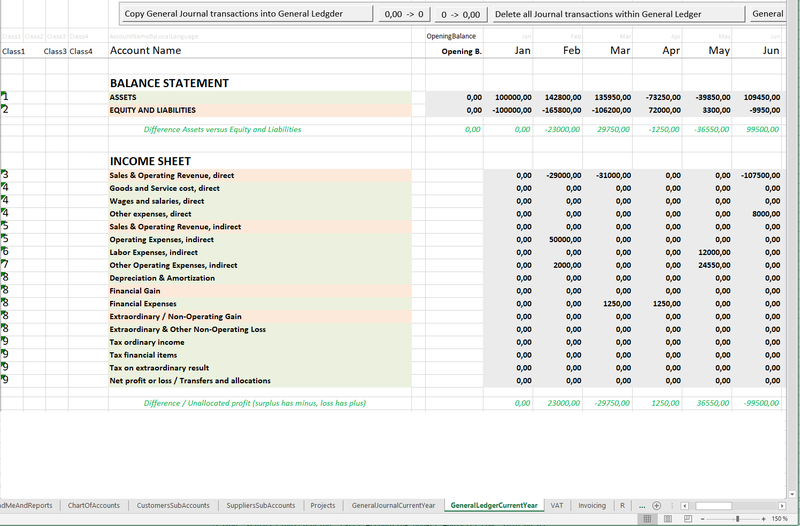 Transferring the general journal data seamlessly to General Ledger through a click. 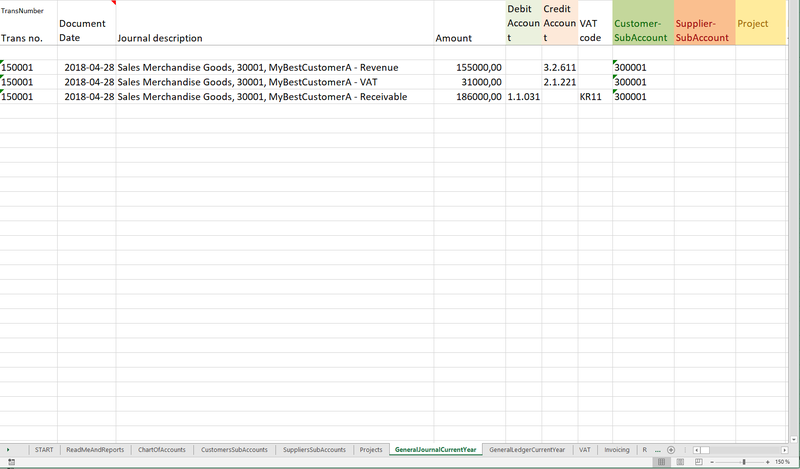 A click execute import of prior year data for use as opening balance. Budget following prior year actual data average or alternative following month's variations can easily be imported through a click. 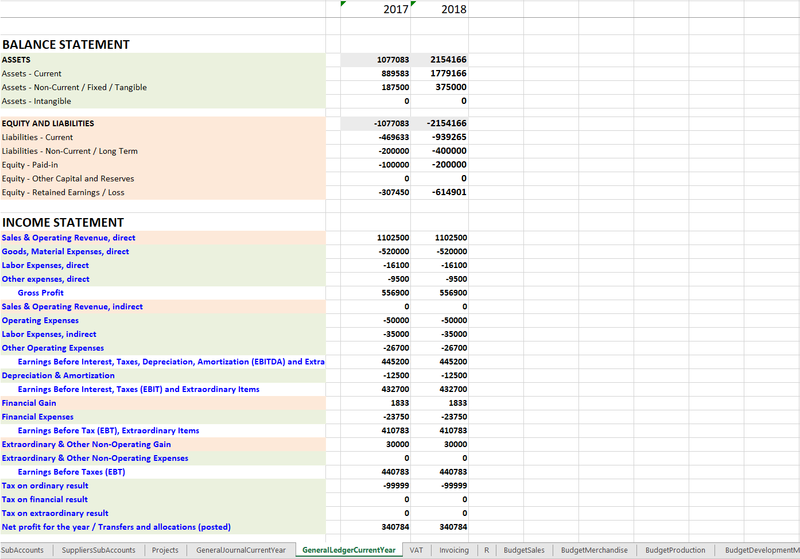 This will give excellent report options on actual versus budget figures, either grouped per class1, class2 or class4 level. 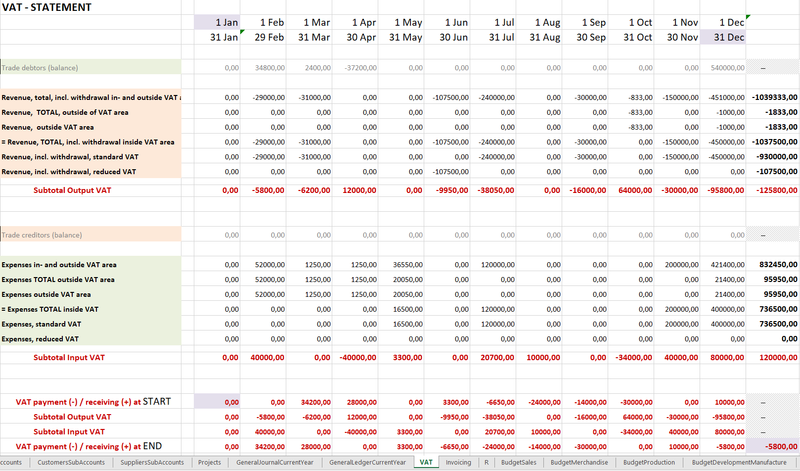 Forecast - setting up your outlook (short term budgeting) for current year, can be done easily. 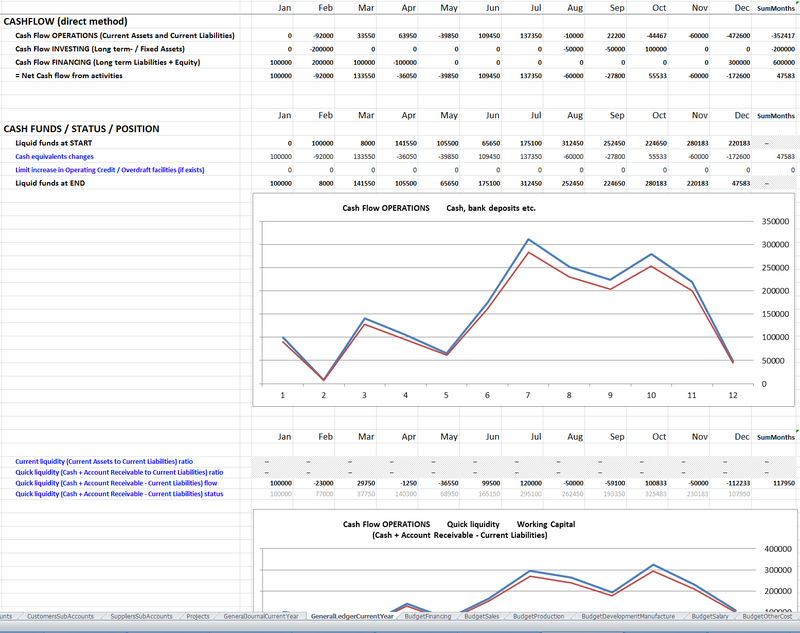 Then you can simulate your forecast for revenue and expenses for visualizing profit. 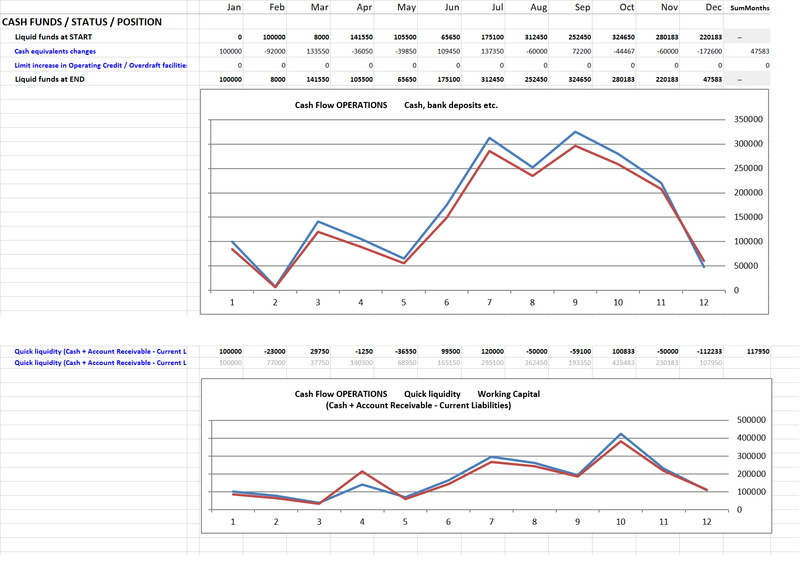 Cash Flow and Net profit for the corporate can be an example of an important «weekly» report. 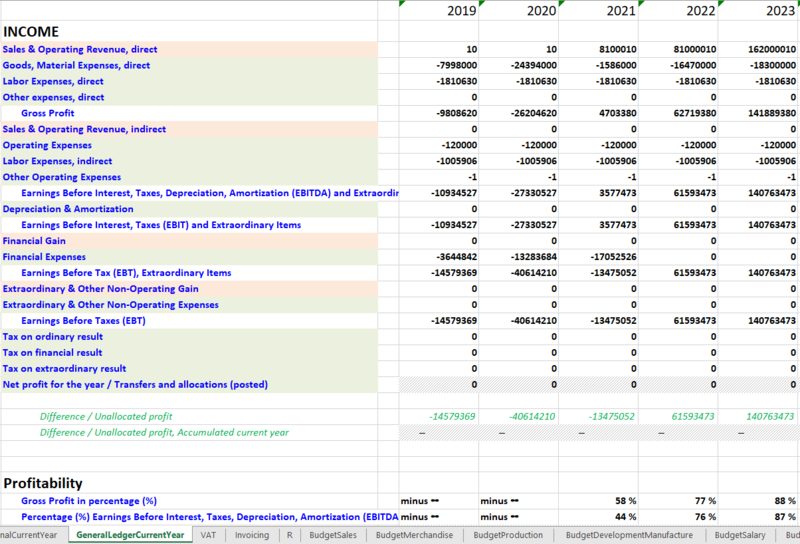 Leader can here see actual figures versus forecast and budget for profitability as well as cash/bank deposits and quick liquidity. Solidity / Finance structure is visualized. VAT/GST/Sales Tax is automatically calculated across multiple levels. Periods are setup according to local need. 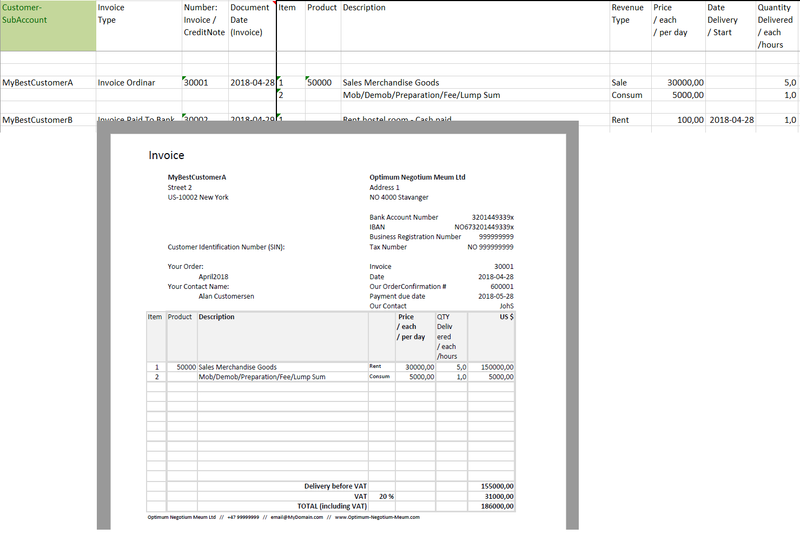 Trial balance summarize all accounts with transactions (and have a drill down option for viewing transactions per account). 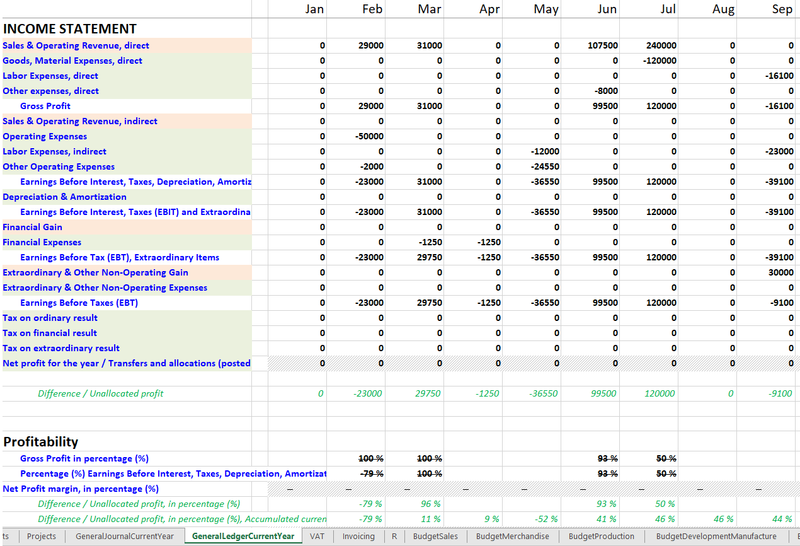 Year End Balance and Income Statements visualized versus prior year. 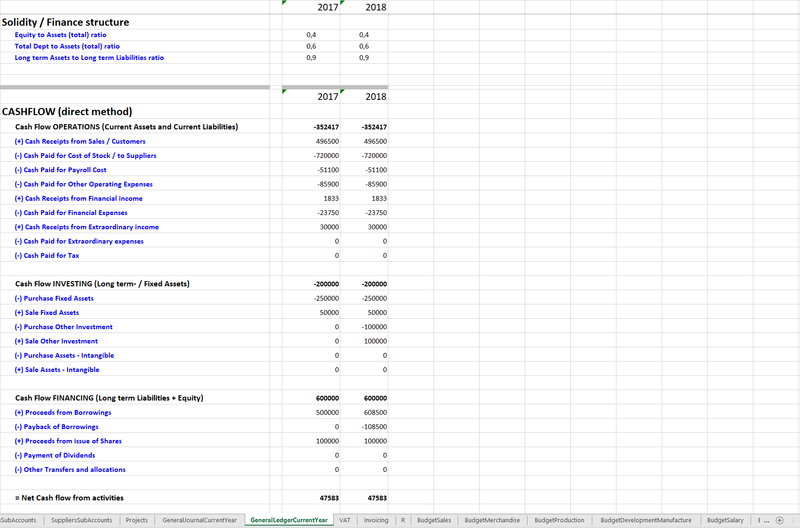 Net Cash Flow from activities statement, Note references, as well as Solidity / Finance structure are visualized. Transfers and allocations of net profit or loss is simple through taxfiler accounts. 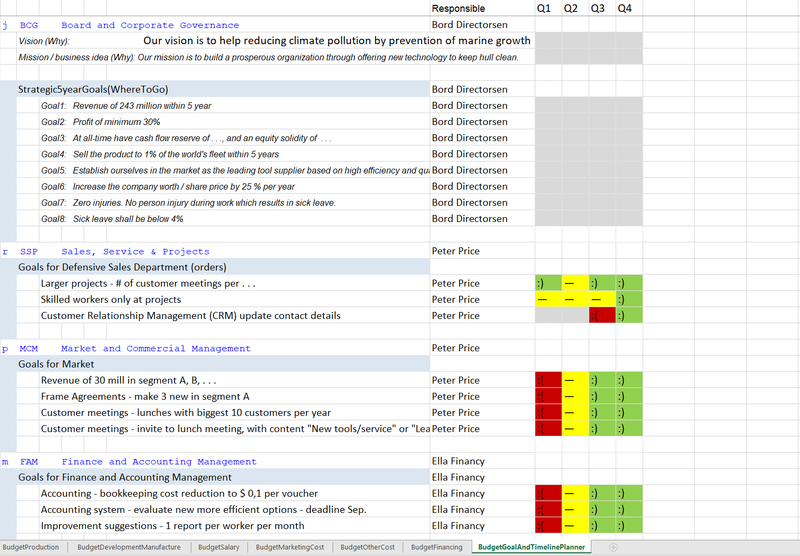 List activities to be executed per responsible worker, for the purpose of getting cost for resources planned for marketing. 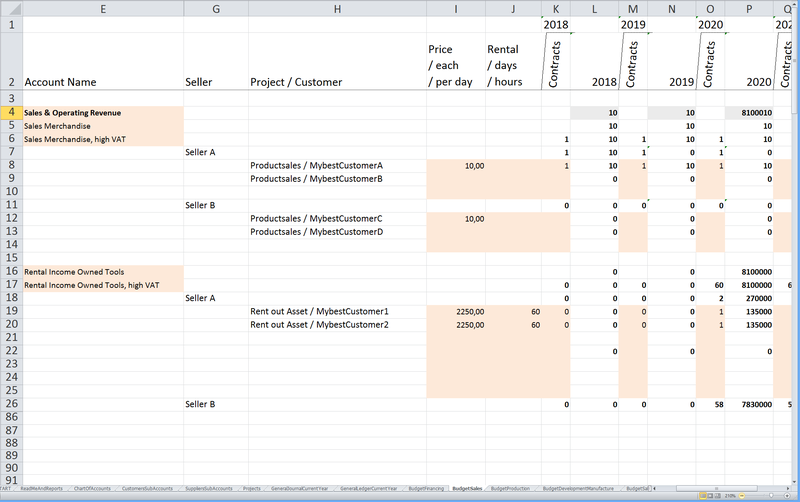 Use the "12 years forward" sheets and columns to setup figures for Income (Sale and Project) and Cost (Merchandise, Production, Salary, Marketing), including financial borrowing and simulating cost of interest for the Financing. 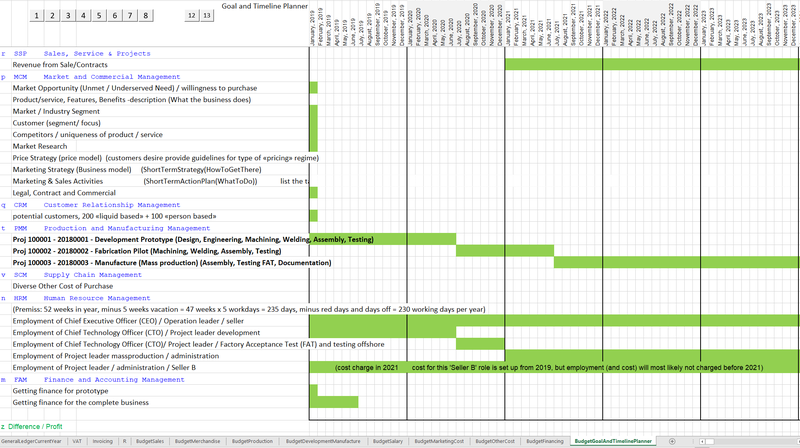 The Timeline-Planner can be used as a GANTT overview. 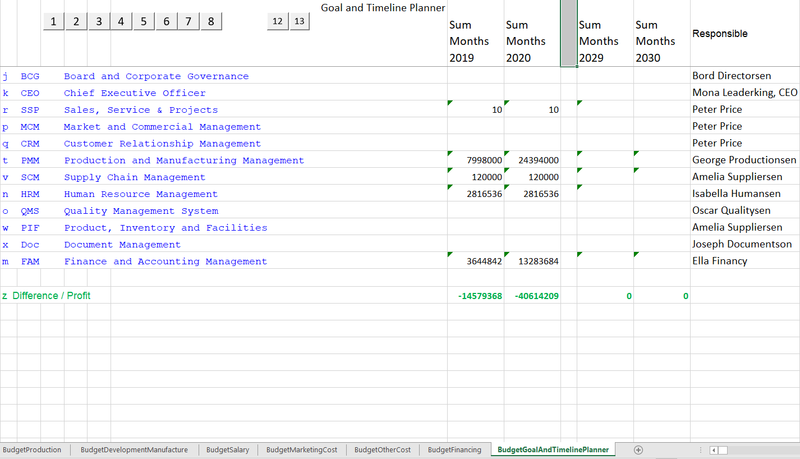 Strategic goals (responsible: Board) can be setup in "BudgetGoalAndTimelinePlanner" under segment "Board and Corporate Governance". Operational goals (responsible: Organizational Leader - CEO) must be connected with sub goals/objectives which again must be hooked up toward each department/role (department leader). 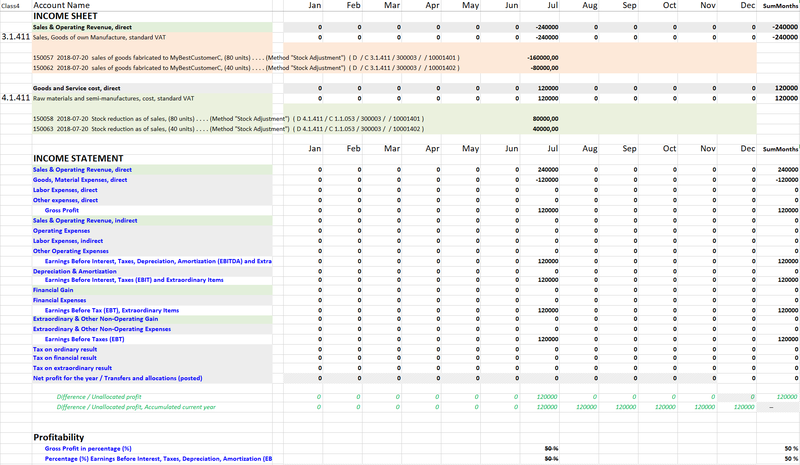 An overview per department will visualize whether goals are reached per week/per month/per quarter or whatever your choice is. Excellent for discussing progress per responsible. And at the very start of your business planning, it's recommended to get clarity in your business' vision, mission and with advantage also values and policies. The new developed product, is offered to 5% of worth, as an introduction offer at US $ 1,- per month for each module functionality (invoicing, bookkeeping and planning, plus $ 1,- for the workbook itself) for the years ahead until 2022.